Are you currently upside down on your car loan? 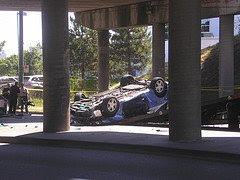 What would happen tomorrow if you were to wreck your car and the damage exceeds the value of the car? Your insurance company would probably "total out" your car. When a car is totalled, the insurance company is only obligated to pay for the current market value of your vehicle; not what you owe on the loan. For example, if you have an accident and the damage to your vehicle is $10k but your vehicle is worth only $5k, your insurance company will probably only pay $5k minus your deductible, if applicable. What happens to the additional $5k you owe? You are still responsible for the balance whether you still have the vehicle or not. You will need to either pull the $5k out of your savings or roll the loan amount into a new car loan. Congratulations, you are now even more upside down. How do you get upside down in a car loan? It's really simple. You go to a car lot. You buy a shiny new car and take out a loan. If you don't put any money down, as soon as you drive off the lot, your car has depreciated in value and you now owe more on the vehicle than it is worth. How do you protect yourself from being upside down? Pay in cash. Save up and only buy as much vehicle as you can afford to pay in cash. Down Payment. If you are not able to pay for your the vehicle in full, you should at least make the largest down payment possible. Short Term Financing. Just because the bank will let you carry a car loan for 6, or even 7, years doesn't mean you have to. Experts suggest the longest term you should carry a car loan is for 36 months. If you cannot afford the payment for a 36 month loan, you probably can't afford the vehicle. Interest Rate. If you are financing your vehicle purchase, you should shop around to make sure you are getting the best rate on your car loan. If you are a member of a credit union, I would check with them first. Credit Unions usually have the best rates on auto financing. What if you are already upside down? Protect Yourself. Make sure you have GAP coverage. Gap coverage covers the difference between the loan balance and what you owe on your loan. There are numerous gap coverage companies out there so you need to be sure you know what they will cover and if there is a maximum amount they will pay. I purchased Gap coverage when I bought my last car because I knew that I would be upside down. It was offered when I took out the auto loan and cost an additional $400. I also purchased additional coverage thru my auto insurance company although they will only pay up to 25% over the value of the car loan. Extra Payments. It's best to make extra principal payments to knock down the balance of your car loan. Not only will you pay less in interest, you will eventually get "right side up" on your loan. Once you are no longer upside down on your car loan, use the above tips to protect yourself from getting upside down again. Once you've paid off your auto loan, go ahead and open a savings account to save for your next vehicle. That car payment you were sending to the loan company can now be sent to your savings account. If you liked this post, please consider subscribing to SingleGuyMoney. I recently checked which side of the car loan we were on. Fortunately, we're a couple hundred bucks above water. And we should be paying it off faster than it'll depreciate, at this point. It was bought 2 years old, which is a good state for avoiding major depreciation. We always pay cash for older, used cars. I say "always", but we've only had to buy one- the last one lasted over ten years. If it's a well maintained Honda, it will last forever and a day. This is our last bit of "stupid tax" that we will have to pay. It took us a while to get on this frugal with our money thing a ma jing. We have a $460.00 a month car Mistake(loan). We hope to double up the payments on them soon.